Where will the 30-year fixed mortgage rate be next year? How will this affect the housing market? What has happened to mortgage rates in previous episodes of hikes of monetary policy rate? Is the low for sale inventory a new normal? These are some of the questions that Frank Nothaft tackles in this interview. Nothaft is a Senior Vice President and Chief Economist at CoreLogic. Hites Ahir: CoreLogic recently hosted RiskSummit 2017 in California. What is the idea behind this annual event, and can you tell us about the audience at this event? Frank Nothaft: CoreLogic’s RiskSummit is a housing conference for our clients. Now in its 29th consecutive year, RiskSummit brings together hundreds of domestic and international executives from mortgage banking, capital markets, home insurance carriers, regulatory agencies, government-sponsored enterprises, multifamily and rental property management companies, and real estate information providers. Hites Ahir: At the event, you made a presentation on the US housing market. The first thing you did was to take a poll from the audience on where will the 30-year fixed mortgage rate be by the next RiskSummit 2018. What did you find? Frank Nothaft: There was consensus that mortgage rates will be higher a year from now, but with a wide dispersion in views. It reminded me of the latest projection material from the Federal Open Market Committee (FOMC) members, who expect the target for the federal funds rate to be higher by the end of 2018 but with wide disagreement on how much higher the target will be; FOMC members’ views varied from no change in today’s target to a 200-basis point increase! (see FOMC Projection Materials June 2017). Hites Ahir: What is your view? Frank Nothaft: My view is in line with the consensus projection: Namely, that mortgage rates will be higher a year from now. Today, 30-year fixed-rate mortgages are up about 50 basis points from a year ago, and it is likely that mortgage rates will be up an additional 50 basis points a year from now. Even if that increase should come to pass, raising 30-year mortgage rates to about 4.5 percent, these rates will still be remarkably low compared to where they have been historically. 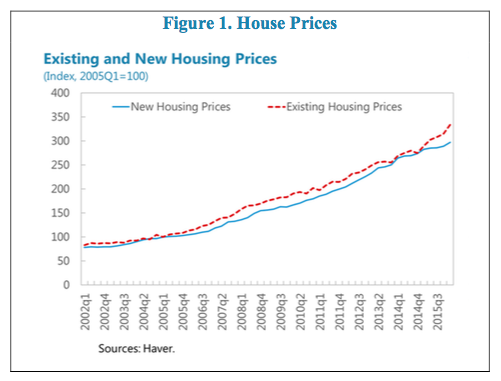 Hites Ahir: How will this affect the housing market? 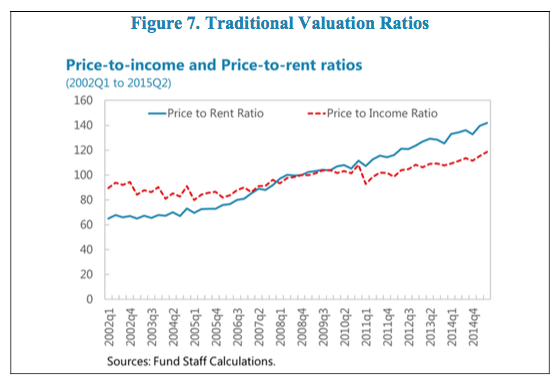 Frank Nothaft: There are several effects on both the housing and the mortgage markets. The most salient effects in the housing market are a decline in affordability, and a slowing of homeowner mobility. The latter point is sometimes referred to as the ‘lock-in’ effect: Homeowners with a mortgage rate that is significantly lower than current interest rates may be less willing to ‘trade homes’ and take on higher financing costs. When we compare the re-sale frequency when mortgage rates had risen by, say, 1½ percentage points compared with their level as of the original purchase, we found that the mobility rate was lower. This suggests that the for-sale inventory may continue to remain lean for the foreseeable future, adding upward pressure to home-price growth. Higher interest rates also have significant effects on the mortgage market. For one, refinance originations generally fall sharply. The median mortgage rate is about 3.75 percent today, and as market interest rates rise the amount of mortgage debt that remains ‘in-the-money’ to refinance shrinks. Thus, the drop-in refinance originations implies that overall lending volumes will likely be somewhat less in the coming year. On the other hand, annual originations will likely be less volatile in an environment of higher interest rates, as purchase-money lending has less year-to-year variation than refinance. Hites Ahir: What has happened to mortgage rates in previous episodes of hikes of monetary policy rate? Frank Nothaft: The Federal Reserve has direct control over the discount rate and the federal funds rate, and substantial influence over other short-term interest rates. 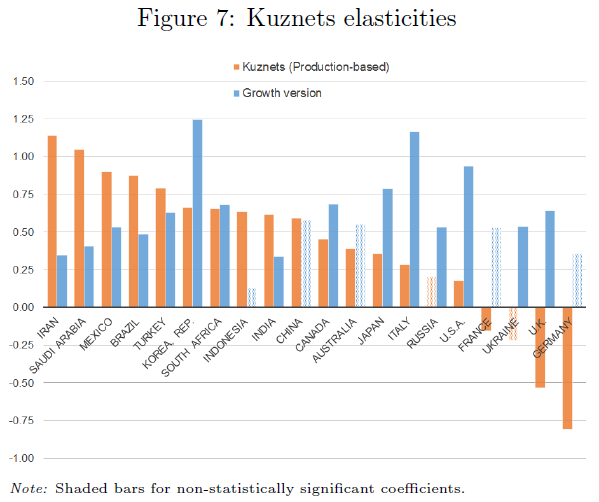 But its effect lessens as one moves to longer-term maturities across the yield curve. Long-term yields, such as on 10-year Treasuries or 30-year mortgages, will also be affected by investors’ inflation expectations. 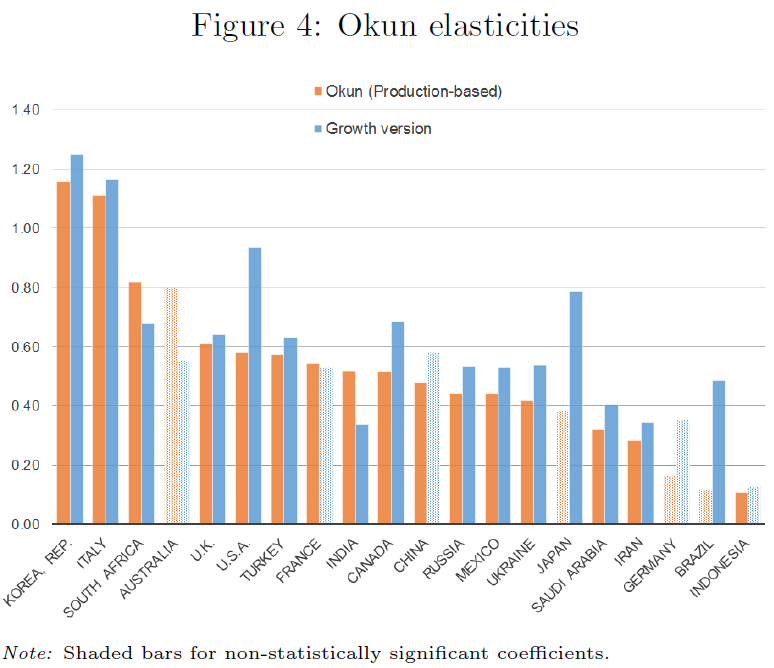 If the capital market thinks that higher short-term rates reduces inflationary pressures, then long-term rates may show little change or even decline. Conversely, if the market believes the Federal Reserve is increasing short-term rates too slowly, then the entire yield curve could shift up. In other words, sometimes mortgage rates have moved higher, sometimes lower. I believe that mortgage rates are likely to move higher over the coming year because the Federal Reserve has also indicated that it plans to reduce the size of its mortgage-backed security and Treasury bond portfolio over time. 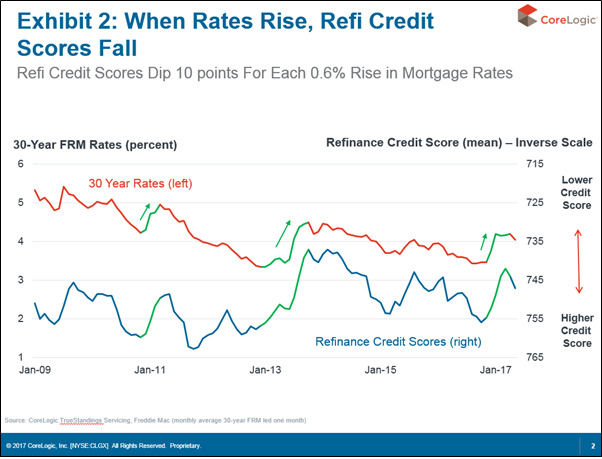 Hites Ahir: “When Rates Rise, Refi Credit Scores Fall”—this is one of slides of your presentation. What happens when you look at period before and after the Great Recession? 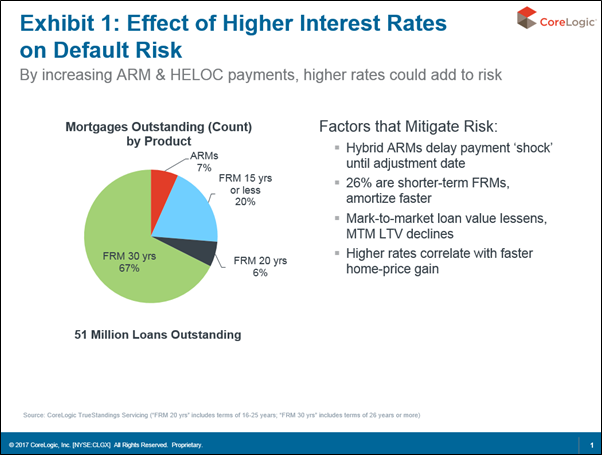 Frank Nothaft: In general, when mortgage rates have risen, we observe the credit scores of refinance borrowers decline. (Exhibit 2) This could reflect an increase in ‘cash-out’ refinance, or an increase in FHA-to-Conventional refinance as a share of refinance. The latter is particularly important because the FHA, since January 2013, has not allowed termination of the mortgage insurance premium payment. The only way for a borrower to ‘cancel’ the mortgage insurance premium is to refinance into a conventional loan with a loan-to-value of 80 percent or less. This type of refinance has picked up and may account for 200,000 refinances in 2017. Thus, one reason credit scores for refinance borrowers dip when interest rates rise is that FHA borrowers typically have a lower credit score that conventional borrowers, so as FHA borrowers refinance into conventional, the average credit score of all refinance borrowers dips. Hites Ahir: You also point out that there is a low for sale inventory. Is this a new normal? Frank Nothaft: Yes, I think it is a ‘new normal’. We measured the for-sale inventory relative to the housing stock and found that the inventory was the lowest it has been in at least three-and-a-half decades. And if higher mortgage rates reduce homeowner mobility, and thus reduces the number of existing homes offered for sale, then the low for-sale inventory levels will continue. The Appropriate Government Role in U.S.